GOG is putting 100 games on sale for its Fall Insomnia Promo, but supplies are limited, so call now! The idea of limited stock in a digital store is kind of silly but anyone who's ever been told that there are no more Steam codes left knows it's not unheard of. But GOG is putting a different twist on it with the Fall Insomnia Promo: Instead of pretending that its shelves are all out of digits (digitals?) it's putting 100 games on sale in limited numbers, one at a time - and the next game doesn't go up until all copies of the first game are gone. Confused? Yeah, me too, so here's an example: At this very moment, The Dark Eye: Chains of Satinav is available for $3.99 (which, by the way, is a screamingly good deal if you dig point-and-click adventures) and there are 58 copies left out of a beginning inventory of 200. Once that hits zero, that sale ends and the next game goes on the block. What's the next game? Nobody knows! That's part of the fun, I guess. GOG did say that System Shock 2, Fez, Hotline Miami, Rayman Origins, the Baldur's Gate Saga and Sid Meier's Alpha Centauri will all be in the mix, so it's not like they're just clearing out the crap that nobody wants (Gotta make room on those digi-shelves! ), and there will also be some freebies sprinkled into the mix, just to keep you on your toes. 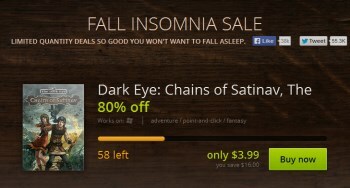 The Fall Insomnia Promo is live now and runs until the games are all gone at GOG.com.